I’ve been painting lots of wood lately. Doors, cabinets, woodwork… I love paint. I love color. But I also love wood. Paint and color and wood can co-exist, but finding that perfect balance is difficult. Rooms with too much wood need color for drama; rooms with too much color scream out for wood to give rest to the eyes. It’s that perfect balance that makes us all sigh and sit down in comfort. “Yeah,” he said. “That stuff just can’t be stripped off.” He sanded the door and then gave up. His advice? “Just paint it. It’s only poplar.” So I painted it early-nineties blue and stenciled it with early-nineties flower stencils. And now, twenty years later, it is relegated to holding craft supplies in my upstairs craft room that is not open to the public. So many pieces of beautiful old furniture ruined. And so I learned — Don’t paint it, if it can never be reclaimed. Aunt Sara and Uncle Judd were astonished when my mom picked that particular pink piece of furniture. Mom dragged it home (it comes apart in two pieces) and she and Dad lovingly restored it. Mr. H.C. thinks it is walnut. It is a bit quirky, but I love the fact that it is a one-of-a-kind antique, passed down through family, that many hands have touched it, restored it, made it their own. I love the circle that life is. I understand wanting to make a piece of furniture, or a house, your own — individualizing it. That’s what we are doing with Apple Hill Cottage, after all. DIY is good. But what happens when the DIY goes bad? Let’s face it, that little washstand I painted and stenciled? I didn’t do such a good job of it. AND fashions change. The turquoise of today will be tomorrow’s outdated color. The white cabinets of today will be dated in ten years. Recently I read a post about “reviving an antique Windsor chair” by painting it blue. I laughed to myself. I did that once. I painted a lovely oak pressed-back chair glossy forest green; BUT I only painted it because it had already been painted orange. (Yes, by my mom — it sat right next to that orange washstand in our basement.) And it was never going back to its beautiful oak original beginnings. All those rungs? All that carving? All that glossy paint? I repeat: Don’t paint it, if it can never be reclaimed. Do not paint any family heirlooms. Do not paint anything that might be valuable the way it is. Do not paint anything that has carving or curves or moulding that would be hard to sand back to its original condition. Try to find pine furniture (or poplar) for painting. Or better yet, find something that has already been painted. Paint only furniture that you are willing to refinish or throw away, when your mind (or the fashion) changes. And our minds change frequently, don’t they? 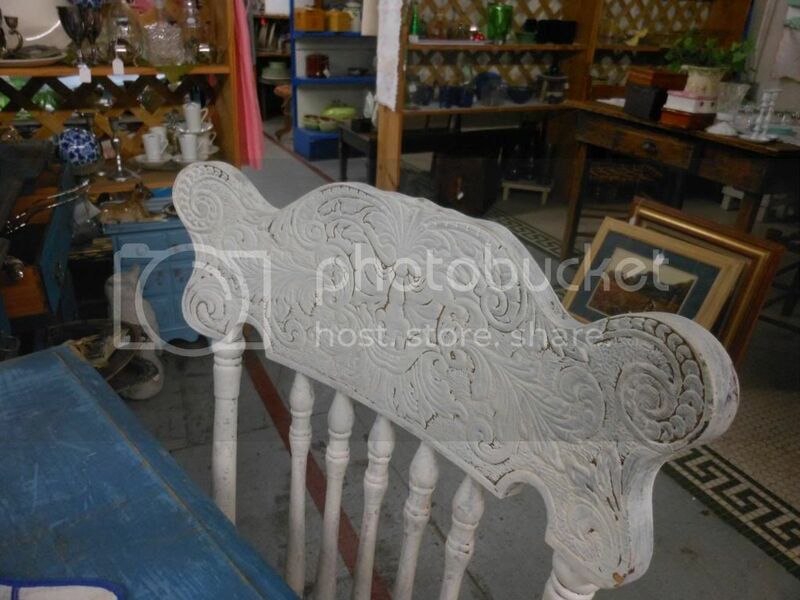 With all that said, I’m looking for a few cheap dining room chairs to paint…. To find directions on how to do something like this to the top of YOUR old desk, see the post on DIY: Trash to Treasure desk renovation.. I have an ugly wood desk in my not-open-to-the-public craft room upstairs. I would love to have that flower top on it… And I could paint the bottom a pretty, rust-colored orange… oh, wait. I can’t paint it orange! It belongs to Mr. H.C., the carpenter who hates to paint wood. But I do have a washstand that could stand to be painted…Maybe orange, huh, Mom? Great post – my two cents: if you love it, don’t paint it. If you don’t love it, paint it and fall in love with it! I’m pretty sure the one I stripped was the orange one! And I repainted it! Love the post. I didnt know that story of Uncle Judd’s pink cabinet. They did an amazing job. I was thinking you might have the orange one too! I think it’s a little bigger than the one I have. What color did you paint it? This post made me laugh because I just started painting the top of a table given to us years ago, but it seemed to be laminate, well made from the 50s I’m guessing, but still laminate (just the top though, odd) have you ever tried painting laminate? I just put on the second coat of white and plan to do several layers of poly. Will it hold up to three kids??? Also when you say an oil finish what do you use? I just rubbed linseed oil on a large stump I’ve sanded smooth but the toxic warnings on the side were rather frightening. What would you recommend?? I painted an under-the-sink cabinet in our current bathroom that I’m pretty sure was laminate. I gave it two coats of black satin latex seven years ago, and it still looks pretty good — only minor touch ups needed around the handle. But it isn’t a table… Husband contractor Mr. H.C. says poly will protect it, but it might turn it yellowish — especially if it’s white… That said, a friend of mine just sent me a link to an article in our local paper about a woman furniture maker, Amy Howard, who has just put out a bunch of one-step painting materials for the DIY type who wants to renew furniture. I’ll find the link and post it to you in another reply. And if the laminate top doesn’t stay painted, there’s always tablecloths!